I’ve always leaned quite heavily on the module for my adventures. I know that creating my own stuff is an area of my DMing that I’m quite weak on, despite it being commonly held to be “one of the greatest rewards” of DMing. I often just don’t know where to start, and I get all wound up on the formatting and literally lose the plot. 4e was a real help for me in that regard. It’s encounter based design paradigm really got me over a hump in adventure design. It felt like one of those Lego sets where you start off building the picture on the front, but can then start to modify it, or strip it back and custom build it. The real genius of 4e was in giving the DM a massive stack of game Lego bricks and instructions for how to put them together. It’s detractors would say the pictures on the front of the metaphorical boxes weren’t the right ones, but what can you do? Can’t please everyone, though Lord knows 5e tries. Dungeon Goal. 7. Find information needed for a special purpose. Wilderness Goal. 16. Pursue fleeing foes. Other Goals. 11. Interfere with the operation of a business. 12. The adventurers must discover the main villains secret weakness before they can hope to defeat that villain. Not bad! Looking through these lists it’s clear to see that there are little nods to classic modules of the past, as well as new (to me) little ideas to act as springboards for the imagination. With the rolls I made above, yeah, I could make a nice little adventure out of that. Then it’s on to Event Based adventures, which are acknowledged as slightly more tricky to plot out. There’s a couple more tables here, concentrating on a villain and their overall goal. Then there’s discussion of specific types of scenario with Mysteries, and Intrigue called out. Finally this section is wrapped up with Framing Events. Let’s roll! And complications, twists and side quests. Phew. That’s going to get you a side of A4 covered in good notes in no time at all. For some games (Dungeon World?) that might be all you have to write. For the rest of us though, the chapter then delves into the nuts and bolts of building encounters. Page 82 is going to get heavy use at my table, as it’s where the combat budgets are set. It’s not complex, but neither is it foolproof like the 4e version was. The big difference is a return to single monsters as the default combat encounter. 4e loved the cantina band approach, and that’s still possible, but adds in multipliers to XP tables. 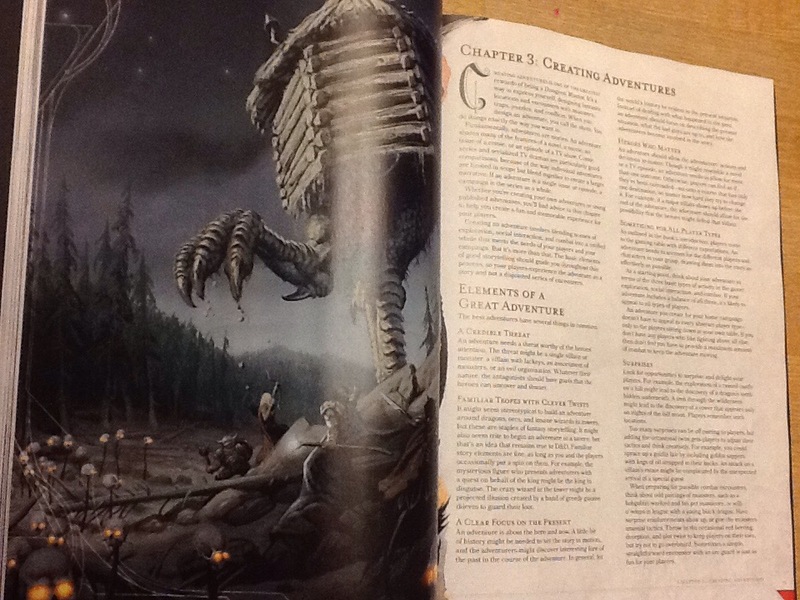 There’s also explicit guidelines to the ‘adventuring day’ that 4e really hammered home. Here it’s a bit looser, but the structure is available to help everyone stay on message. And finally, a couple of pages on building Random Encounters tables. These were conspicuously absent in 4e, as everything in that game was tooled to precise tolerances. With the return to vague story ideals, this section uses the old Wandering Monsters trope as a world building device. Yeah ok, I guess. Not for me, but I don’t begrudge it being there. Overall. A good chapter, full of interesting tables that really help you get past the blank page syndrome. After that it’s all a bit looser, and not massively newbie friendly (perhaps a sample adventure would help here). The sole crunch comes from the XP/encounter stuff and that looks… Ok. With a couple of areas still to be fully explored in later chapters, I’ll leave this chapter on probation for a bit.